Retired action movie hero joins local hunting club. "Eat lead you Commie fowl!" 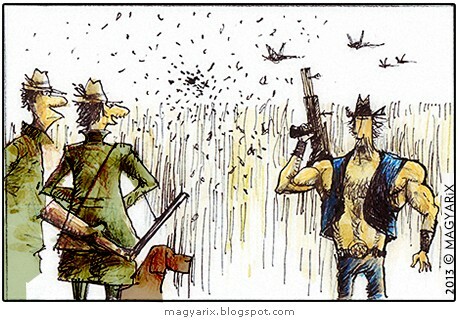 Yep, poor birdies wouldn't have a chance. Hey, so that's how you carry a double-barrel shotgun so it's safe. Now I know! -and I appreciate you taking the extra time to add a bit of color. Very nice! Eat what you shoot...if you can find the pieces!